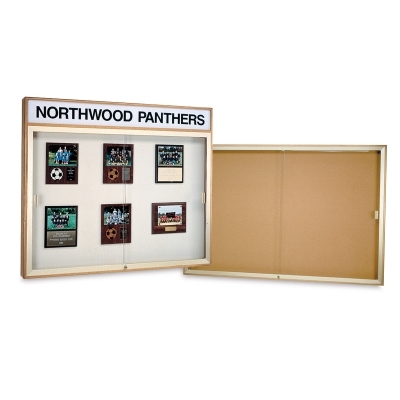 The Waddell Legacy Series Wall Mounted Display Cabinet is a distinguished way to display artwork, plaques, ribbons, citations, awards, announcements, and more. It's ideal for high traffic areas because its slim profile extends only 4" (10 cm) from the wall. This handsome case is finely crafted of solid oak with a rich Natural Oak finish and Champagne anodized aluminum trim. The tempered glass sliding doors are 3/16" (0.5 cm) thick and feature built-in locks. Hanging hardware is included. The Display Cabinet comes with either a natural cork or plaque fabric back panel, and it's available with or without a header. 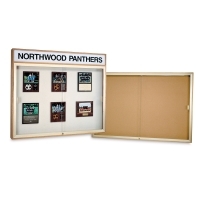 Cabinet with Header — The 5" (13 cm) high illuminated header panel is generously sized for prominent display of your school, company, or institution name.